We are fortunate to have one of the UK’s top coaches, Mark Mitchell, co-ordinate our junior session on a Thursday afternoon. Mark also coaches adult players during Wednesday evening practice sessions. Mark is a former England international player and has coached senior England players and the British team at the Paralympic Games. 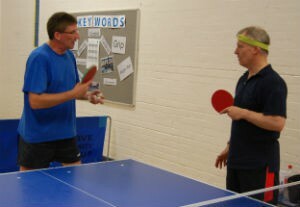 Mark also coaches at St Neot’s Table Tennis Centre. 1 to 1 coaching is also available from club player and coach Tom Lodziak. Tom is available on weekday evenings and also weekends. Tom is also a keen table tennis blogger and has written many articles to help players improve. You can find out more about Tom on his table tennis website. Informal coaching is available from club organiser, Kwok Kee Chan. League players at the club are often happy to share tips and tactics.